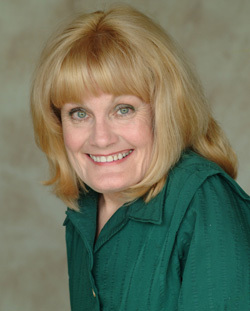 Marcia Derousse is the actress who portrays Dr. Ludwig in the episode “Scratches”. I had the pleasure to get to know this extraordinary lady who, besides acting, has another very special talent. Although I live in the Los Angeles area now, I am from southern Missouri, the foothills of the Ozarks. Beautiful area, but not much opportunity for acting. I did study acting in college, and did a good bit of theatre performance there. My degree from the University of Missouri, Columbia, is a BS in Ed, for Speech/Drama/English. I did teach both junior high and high school. Since I am only 4’4″ tall, my students were usually taller than me! But we had mutual respect, so that was never a problem. I also have been a stand up comedienne in the midwest, including Chicago, and then out here in LA. Theatre is my passion, like several other of the actors in True Blood., including Stephen Moyer and Alexander Skarsgård, who I had the pleasure of working with. Alan Ball worked a lot in theatre, so I think he appreciates the discipline we theatre folk have. 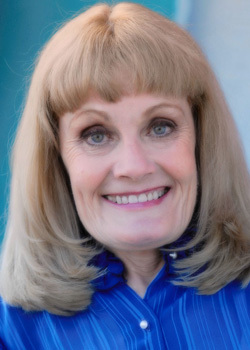 I have done TV and film, including guest star work on The Fall Guy, St Elsewhere, Divorce Court and I did work on Small Wonder, Gimme a Break, Highway to Heaven, Faerie Tale Theatre, and I did monster voices on Little Monsters. I stopped to take care of my beloved mother until she passed away in 2000. Then I started full tilt in theatre again, doing a lot of Shakespeare and other classical theatre. Then in 2002, I was cast in the film Tiptoes, playing Mom to Matthew McCouaughey and Gary Oldman (Gary played a little person!). Now, I am thrilled to be bringing Dr. Ludwig to life. When and how did you decide to pursue a career in acting? Since I was always “different”, I used that to my advantage and made my friends and family my captive audiences, even as a kid. I started my stand up comedy in junior high school, much to my teachers dismay! But I became really serious about acting as a profession when I moved to LA. I moved here in September, and got my first film job in December that same year. Not bad, huh? You are a little person, how are the opportunities for you as an actress? In theatre, I have never played a role that called for a little person. I was always just a person. So in many ways, this could be one of the reasons I love the stage so much. TV and film work is much more narrow- if the role doesn’t call for a little woman, chances are, I won’t be called in- at least not very often. I would love to see that change. See people realize myself and all little people, in fact any people with differences or disabilities, are people first, and “unique” second. So the opportunities in TV and film are sadly, few and far between. It seems to come in phases. How did you get involved in True Blood? What can you tell us about the audition? I have absolutely wonderful agents. They do submit me for anything calling for a little woman, as well as other roles. My friend had seen the breakdown for True Blood and called me to give me a heads up. I called my agents and they had submitted me that morning- a Thursday. The next day, I was at the studio for the audition. There was myself and one other little woman, who is a dear friend. So to me, which ever one of us got the role would be a winning situation. But I have to admit, I am thrilled it was me! Alan Ball, Rayelle Tucker, Scott Winant, and the other folks present were very receptive to my reading and interpretation. They were a fun “audience”! Did you watch True Blood prior to the audition? Last fall I was co star in a play called The Sugar Bean Sisters (for which I was named runner up for best actress in theatre in LA for 2008), and my sister co star, Pattie Tierce, has already been on the show. So I watched her episode, and was a fan from that moment on…still am! You play the role of Dr. Ludwig. Who is Dr. Ludwig? I have also read the books by Charlaine Harris, and I found Dr Ludwig to be an almost intimidating character, in spite of her small size. She is a no nonsense, pragmatic doctor/healer, who is willing to work with the vampires and other worldly characters. I know she returns quite a bit later in the books, but honestly, as much as these beings are getting hurt, she could be in a lot more! Her size has nothing to do with her authoritative manner, and she is not scared of anyone or anything! I hope the fans love her as much as I do. You read the books by Charlaine Harris. Is show Dr. Ludwig different from book Dr. Ludwig? In the books, Dr. Ludwig is described as olive skinned, dark haired and has a very big nose. When I read the books, I thought, “What a great character!” But I knew if they followed the books, I would not be considered. Thank you Alan Ball for going against type! Personality wise, the TV version is pretty close to the book version. She’s matter of fact, curt, all business- and someone who is not afraid to work with vampires. She was really fun to interpret. Raelle Tucker’s great script really captured a unique essence for Dr. Ludwig. How do you feel about the differences between the books and the show? Do you prefer one or the other? I feel like the show incorporates the really salient points in the books, but it also surprises us with different twists and turns that are not in the books. That’s fun to see how or what will be the same and what will be created. And I love both. I like the surprises the TV show comes up with. And being an avid reader all my life, I love the books. What can you tell us about your time on the set. You made a guest appearance and worked with actors who have been working as a team for some time now. How did you fit in? Anna Paquin came up to me after the first full reading and introduced herself, saying we’d be working together. She made me feel comfortable at once. On the set, I was in the make up chair next to Stephen (eat your hearts out, ladies) and he was so warm and easy going it was like we were old friends. When I met Alex on the set, he was also extremely welcoming and nice. Again, the theatre training tends to make people more accepting and friendly. They were absolutely wonderful, and I felt like I had gone home while working with them. Dr. Ludwig hates both of them, but perhaps feels a bit more disdainful towards Eric because she’s had prior dealings with him. So, if she were to pick a team, it would probably be Team Bill. But if he’s smart, he won’t bet his life on her…unless he pays her VERY well. As for Marcia, I was equally charmed by both of them- “glamoured”, in fact! Do you have any films or upcoming theatre appearances in the pipeline ? I am working on two independent films this summer, each very different from the other, and both fun. “Piehead” is the name of the first one. I play the grandma of the lead character. I ADORE playing the little old ladies- they are fun! The lead, also the writer and producer, is making a film about her move from Pennsylvania to Hollywood. The second, still untitled, is being produced by one of Joey Travolta’s groups. It is about a comedy duo who break up, and only one of them goes on to become a star. Geri Jewell (Deadwood, Facts of Life, 21 Jump Street and more) and I play the comedy duo. Two stand ups playing stand ups- what a concept! But the film has a lot of really interesting twists and arcs. Besides acting you also work as a psychic/medium/pet communicator. What is your talent exactly and how do you use it? As I say when I do public speaking, I see dead people and I talk to the animals- sort of like a mini Sixth Sense and Dr Doolittle all rolled into one! I help people realize their loved ones who have crossed over are not dead- just in a different place. I really see them- people and pets- who have crossed over- in their spirit form, and they communicate messages to me to give to the people I am reading for, usually messages of love, and assurances they are still alive. I also give psychic advice to people via my Spirit guides, who are extremely wise and wonderful. I can also “sense” what past lives people have lived, which can be helpful to people in their lives now. How can people contact you for a consult? The best way to contact me for a consult is via my email for that purpose: smallmedium@sbcglobal.net. Well now, she’s an interesting woman. When I first saw her in last night’s episode, I said she was perfect for the role. The attitude is spot on. With Dr. Ludwig, it’s all about attitude. Great interview, Shad. Thanks for introducing us to all these wonderful actors. Thank you so much for this article. As soon as I saw Dr. Ludwig, I thought she was perfection for this role. It’s nice to read about her and get some background. I found the article very informative and really enjoyed it. I really liked her as Dr. Ludwig. She is a fiesty, gutsy woman and I like that. I hope she has more air time in TB. Thank you Shad for introducing us to this wonderful woman. Another great interview, Shad! Hope we see lots more of Dr. Ludwig in the show – she’s a great counterbalance to the vamps! Two simple words but she delivered them with a wealth of disdain – love her in this role. i love a woman who doesn’t take any crap! and she is precious in this role, and i would like them to explore her in some kind of way. enjoyed very much her bio. I would love for her to become a series regular. I so enjoyed her in the role of Dr. Ludwig. She is a great actress and is perfect for this role. I’m constantly amazed at how Alan Ball is able to find just the right actors for each role and Dr. Ludwig is no exception. Loved this episode. Yes, I’m also glad that Dr. Ludwig is on Team Bill! Yahoo! Fantastic casting even though her appearance is different than described in the books. I really enjoyed her performance, just the right balance of being ballsy and acerbic. Well I am glad you decided to make your presence know. Love you username! She is such an intersting and fascinating person. I loved the interview. Thank you for conducting it Shad. I loved her in last nights episode. I sure hope we get to see her some more in Season 3. Let’s make her a regular AB! She was so perfect with her delivery of her lines. She was funny and wonderful. I really liked her character, Dr. Ludwig – she was quite a pepperpot! LOL !! Wow, how great to see Marcia deRousse in this quirky role. I have had the great privilege of seeing her work onstage and she is one actor it’s impossible not to notice. Brilliant performance, brilliant casting. More Dr. Ludwig, please! another example of perfect casting. loved her attitude. i would love to see her heal a vampire or shifter. Loved the Doctor. I admit it – have not read the books, so I don’t know what Dr. Ludwig is “supposed” to be, but loved it. So great to have a little woman who can deal with “the boys”. She was so funny last night. I love how she told Eric to “f**k off” (even though I love Eric). I hope we see more of her than we did in the books. Loved the character and would love to see more. She fits in nicely and would make a great addition to the cast. She was perfect as Dr. Ludwig. I darn near fell off my arse last night when she told Eric to “eff off”. Having read the books, I expected a very dry & direct type of character but this … oh, she just nailed it. You rocked the episode last night, Marcia!! I absolutely loved your portrayal of Dr. Ludwig and I really hope she becomes a regular character on the show. When you told Eris to “F off” I nearly fell off my couch laughing…..that was perfect and hilarious!! Bravo to you, Marcia, Bravo!!!! I agree with everyone else’s opinion, kudos to this bright, exceptional actress. I have never seen her before, but i believed she was Dr. Ludwig from the get go. The vamps need someone to keep them in line and she is just the one to do it!! Hope to see her more in upcoming episodes. I’m just blown away by Marcia DeRousse’s portrayal of Dr L. Talk about nailing it, talk about spot on! I also saw her in Tiptoes and I would not have recognized her if I hadn’t known in advance that she had the part. I have really enjoyed the novels and I really enjoy the show. Usually I’m terribly disappointed in changes made when I watch a show or a film that is based on something I’ve already read. I usually tell people that if they can manage it, see the show, see the film FIRST. Then you won’t be disappointed. That just isn’t true with AB’s take on True Blood. The books are great, I don’t mean to take anything away from Ms Harris, but the show actually expands on her books and that’s a real turn around. AB, give us more Dr L. I love Eric but now and then he gets a bit too big for his britches and I think Dr L’s up to the task of taking him down a peg now and then. What a fascinating woman, she is perfect for the part of Dr. Ludwig. I enjoyed her performance very much and I hope we get to see more of her in the future. Another great interview Shad! Alan Ball did it again with this great casting of Dr.Ludwig. I definitely liked the TV version better than the book. I hope we see alot more of Dr.Ludwig in the future. I think Eric felt a little intimindated when she told him to f–k off! Love it! Great performance by Marcia! Please AB, MORE of Dr. Ludwig! That last line was so funny, she really showed Eric who is boss! What a character– I can see this Dr Ludwig character really developing and adding more substance to the show—lots of possibilities! Awesome interview, great actress. She rocked it as Dr. Ludwig. Thank you Shad! This was my first time to watch the show. Loved Dr. Ludwig and her sassy and fearless attitude! I feel certain adding her into more episodes would add to the show. Yeah, it would be fun to see her doing more “healings” on these vampires. Wow! Great casting Mr. Ball! She was perfect! She brought this character to life: please add her in more!!! Her attitude was so great for this show!!! !